…and you will see a world in distress. Each day seems to bring news of fresh disasters. The media spill out an endless stream of stories about growing threats to the environment, troubled economies, and dangers to the climate. We are overwhelmed by reports of failing nations, crime, intolerance, disease, terrorism, piracy, war, natural disasters, drought and spreading famine. What’s happening to bring so much misery into the world? The subject may seem complex and multi-faceted, but there’s a single culprit responsible for most of the troubles we face — an “unusual suspect” that is the root cause of nearly everything that’s wrong on Planet Earth. Aha, you may be thinking: If there’s a single cause for most of our troubles it should be easy to solve them, simply by eliminating that cause. But you would have to think again when I reveal that the culprit is agriculture, and in particular the aggressive style of industrial farming that has replaced traditional methods in developed countries and is being spread across the world by multi-national corporations through the process of globalization. But…isn’t agriculture a force for good? It puts food on all our tables. Its bounty makes possible the comfortable lifestyles most Westerners enjoy. It feeds the less fortunate. It allowed our species to thrive and build great civilizations. Agriculture lies at the heart of humanity’s finest achievements. 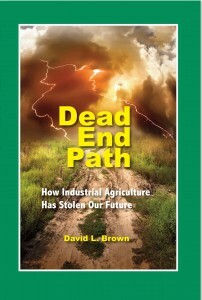 DEAD END PATH: How Industrial Agriculture Has Stolen Our Future, by David L. Brown. ISBN #9780996608541. Published by Moab BookWorks. Retail pride: $12.95.